We begin with an ethereal, beatific prologue: a space journey triumphantly completed, friends and lovers, the chosen few, hand in hand on the shores of a glorious new utopia. This planet, their planet, is perfect. Their ship is about to land, marking the first day of a perfect history. A cold hard reality shatters this idyllic dream, as the main character and narrator (who essentially remains nameless throughout) is literally dragged into a brutally physical reality. Who is he? He's damned if he knows, although clearly something in his life has gone seriously wrong. And this girl trying to tug him down the dark metal corridor, who is she? What is this book she keeps talking about? He's damned if he knows these things, either. Naked and cold, and in the absence of any other notion of what to do, he stumbles after the girl. Purpose and memory must wait, the deadly cold is chasing him down the corridor and the next breath, the next slipping, lurching steps are for now the only priorities. As his quest through the shadowy, nightmare world of the damaged spaceship progresses, our protagonist begins to recover some fragmented memories and to develop/discover a personality. He appears to be an academic of sorts, a Teacher, and this title becomes probably the closest thing he has to a name. But what about this ship? Where's it going, and what is its purpose? What’s his? 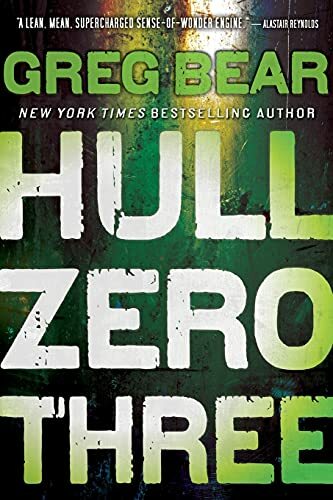 Hull Zero Three is further proof that Bear is one of the best writers of science fiction out there. No, it's not his best, but watered with a little patience, this dark thriller proceeds to sprout macabre, alien tentacles that fasten themselves to your upper body and compel you, puppet like, to keep turning those pages until you reach the last. (I actually burnt my supper and set off the fire alarm somewhere during the end of the novel—true story.) Many of the SF tropes are familiar—Teacher emerged from a pod, after all—but the novel succeeds not so much because of new ideas, but the way those ideas are used. However, it is also delivered over a considerable number of pages. There's a lot of running, floating, resting, and eating scraps of food, and although all this is broken down into bite-size chapters, some shovel-work is required during this first section. Fans of Bear like yours truly will be content enough to go along with this, knowing he's taking us somewhere. As for the rest of you, stick with it; your patience will be rewarded when, several rooms and corridors later, the narrator makes a discovery which signals the end of the novel’s overtures and the beginning of the story proper. The chamber full of frozen corpses which, on closer inspection, are all identical versions of himself is macabre proof: he is but the latest in a long line of previous versions of himself; like his earlier incarnations he was not born but grown, and his memory appears to have come as a package deal with the body. It'll be a while yet before the story fully blooms, but with this revelation those tentacles begin to snake around your wrists. More struggle and strife for Teacher follow, as he embarks on what seems to be a suicidal but preordained quest to traverse the various sections of the ship and arrive, for some unknown purpose, at the titular third of the three hulls which make up the ship. The book he has now acquired offers little comfort; a sort of composite diary, it consists of entries made by his previous incarnations, discontinued on their demise. On-off gravity doesn't help, but this is the least of his worries; monsters hide in the darkness, enough to deplete the GCI budget of a Star Wars movie. In fact, by the end of the book I felt as if I'd been dragged through hell's own safari. Some specimens of this grim horde are so lethal you wouldn't have time to scream, making it a moot point whether in space anyone could hear you. Teacher's luck eventually takes a rare turn for the better, as he meets up with a small group of seemingly friendly, mostly humanoid individuals, united in confusion if not in appearance. It has to be said that their arrival, whilst unquestionably enriching the narrative, also constitutes another of this novel's challenging aspects. That we are asked to suddenly expand our attention, so long invested purely in Teacher, to incorporate a group, does raise a question mark about the novel's timing. After all, we're now about halfway through: waiting until half-time to send in the majority of the team seems a strange strategy under any narrative circumstances. Bear's decision to leave it so late to introduce us to these guys is a puzzle never fully answered, particularly as they bring yet more questions to a story now bulging with them. But much better late than never, and if the stage is still shadowy, it's at least now full of colorful characters, and it is from here on in that the novel shines its brightest. Bear uses economic language to describe these new arrivals, sketching their outlines and inviting the reader to fill in the detail. The character Kim, a friendly if somewhat grumpy giant, is described in a couple of lines; indeed, the name Teacher originally uses for him—Big Yellow—forms our core visual impression of him. (These new characters are eventually given names in an odd little naming ceremony held by two of the interchangeable girls, although in many ways they remain nameless; Teacher seems to be the only one who uses these new names, and he promptly discards his own new name, Sanjay.) Another character, the female the girls name Nell, is described with similar brevity: she is "a gray figure . . . spidery-thin . . tall" (p. 130). This minimalist approach works; having established that we're dealing with variations drawn from the human template (the same mysterious biological Catalogue that Teacher's own body and memory were drawn from), Bear is able to nudge our imaginations in a given direction with a handful of adjectives. Hard details, where they are used, are sporadic, representative: Kim has "skin [which is] waxy and finely pitted" (p. 126); another has "small, pinkish-red eyes" and "ice-colored teeth" (p. 131). It is our own imagination which connects these dots, and which colors the resulting picture. Bear has to shift gears somewhat when describing the creature Tsinoy; apparently plucked from the darker chapters of the Catalogue, she can change, like some horrible biological Transformer, into any variety of bladed, armored monster that her huge, disturbingly malleable body will permit. (Actually, this character comes close to stealing the show. Her personality, resourceful and compassionate, is at odds with her terror-weapon of a body; she's as aware as everyone else that her appearance is horrific, and the resulting sense of pathos earns Bear further points for characterization.) Naturally enough, such a character requires additional descriptive prose. But even here, Bear as before invites the reader to form their own mental image of the character, using vivid terms to form a strong overall impression , but leaving us the pleasure of filling in the detail: "Shining ivory spines ripple and fold back like bristled fur . . . Its body, below ridges of pale bristle, is corded with glistening spiral bands of muscles connected to silvery-gray bones." (p. 131). The gear-shift is smooth, and it is also pleasingly appropriate that our imagination should play so active a role in creating these characters, dovetailing neatly with the fact that they are themselves the result of some fevered imagination rummaging through the Catalogue. Apart from the girls, who seem comfortable enough in their own mysterious agenda, all are united in confusion. Their collective experiences pooled, this eclectic team is still left with little more than a puddle of knowledge, but combined with limited, grudgingly-given access to the ship's own records, the revelations begin. Teacher (upon whom Fate never really ceases the body-blows) now has to contend with the possibility (note: possibility ) that the rich Earth he remembers, the joyous preparation for a great journey of exploration to the stars, may be nothing more than a cotton candy fiction designed to replace a less palatable truth; that the ship was a dying humanity's final stab at survival. And with so much hinging on this desperate endeavor, contingency plans have seemingly been put in place to contend with any eventuality, including that of finding their new home already occupied. The Catalogue's main purpose was seemingly to produce humans suitably modified for a new environment; Tsinoy's existence seems to demonstrate that it was also built to produce creatures capable of dealing with any civilizations standing in the way. That this star-flung message in a bottle should include so cruel a footnote may not say much for the ship's designers, but any guilt they may have suppressed seems to have arisen later; the ship has been in conflict with itself for an unknown length of time . . . and our group has been press-ganged into the ranks of this chaotic war. The damaged ship therefore becomes humanity's schizoid, damaged mind, Teacher and group caught between the conflicting drives of survival and conscience, contending with the nightmares, here made flesh, that repressed guilt will so often throw up. The metaphor is elegant and subtle, never forced upon the reader. By now you'll perhaps have noticed our arrival in Bear's usual stomping ground, the Land of Big Ideas. The intertwining roles of survival and history, Darwin/Spencer's "survival of the fittest," and the less digestible aspects of eating from the Tree of Knowledge. We've been here before, of course. These themes are as familiar as the rather traditional science fiction concepts Bear has freely utilized up until now (he himself explored the interplanetary Darwinism thing in the Forge of God (1987)/ Anvil of Stars (1992) duology). But Hull Zero Three is a success not so much because it offers someplace new for our imagination to go, but because, like a local villager at a favorite holiday resort tempting us away from the tourist route, it shows us a different way to get there. Take the concept of a desperate humanity's flight to the stars from a poisoned Earth. A familiar idea, but here we are dealing throughout with one possible offshoot of one possible end to that story; thus approaching that idea almost in reverse. This oblique approach to a familiar idea casts it in an unusual and exciting light, and extends to the other themes mentioned above. Bear's original handling of familiar science fiction tropes doesn't stop with the order events are presented in; we also approach events from the ground on up, the story beginning with just that single, no-memory narrative, the reader sharing the narrator's baseline learning curve from the outset. The different narrative approaches intertwine effectively with twists to the ideas themselves: biological warfare from the point of view of the unwilling bio-weapon Tsinoy; space travel presented from an overridingly organic, rather than technological, viewpoint. The text plays with us in other ways, notably the dexterously-timed revelations; by the final few chapters, the narrative is doing its own enticing version of the dance of the seven scarves, revealing itself layer by layer, whilst dexterously repositioning both reader and text, and perhaps reminding us by the end of that old story where the final pieces of the jigsaw puzzle complete a picture which include the puzzle-solver himself. Engrossing stuff. With a figure as monolithic on the science fiction scene as Greg Bear, it's useful to consider the latest offering in the context of said luminary’s existing canon. You'll have noticed that Hull Zero Three is a pretty grim affair, and indeed, the novel is nearly as much horror as it is SF. Thus Bear proves again that he's a multi-genre writer; he's scared us before way back in the day with Psychlone (1979) (and for that matter, delighted fantasy fans with Songs of Earth and Power (1994)). Psychlone and Hull Zero Three are two very different beasts, however. The former, set in present day Earth, is brilliant whilst remaining accessible, like Moving Mars (1993) or Darwin's Radio (1999); something you could dip into whilst on a bus. Hull Zero Three is something more likely to be read in quiet solitude during lengthy sessions, with only a reading lamp and perhaps a few wisps of oven smoke for company. A beginner to Bear's novels, lacking an existing confidence in an eventual reward, may struggle with the shovel-work presented by the slow beginning, and the fact that so much is withheld for so long. But this hypnotic, gripping, and ultimately moving novel is worth the effort, and I urge both beginners to Bear and old hands alike to grab a copy.